Infrastructure-as-a-Service (IaaS) allows users to rent computing, storage and network resources that live in a multitenant cloud. This communal pool of resources is delivered as a service and priced based on usage; in other words, you only pay for what you consume. Users are responsible for configuring and operating their own OS, software, and database. Service levels typically guarantee performance and availability, but the users take on the operational risks (as opposed to Software-as-a-Service, where the provider is responsible for the operational risk of the system, not the user). IaaS is especially popular among SMBs, because it provides a large virtualized infrastructure without the costs or headache of maintaining it in-house. As a result, many companies are using IaaS technology to build their own Paas (Platform-of-a-Service) or SaaS (Software-as-a-Service) technologies. Larger enterprises are also beginning to turn to IaaS, but their adoption rate is much slower. 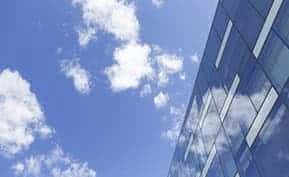 This can mainly be attributed to security concerns; after all, IaaS requires you to “outsource” the architecture on which your company data resides to the cloud, which is a tough pill to swallow for many large IT departments. And yet, the benefits of IaaS are clear. 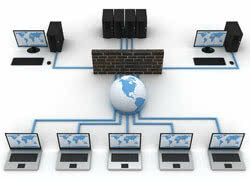 It enables IT departments to take on more projects by making it easier to provision servers. Projects that previously had to be put on the backburner due to a lack of IT resources can now be taken on, thereby effectively keeping companies at the forefront of technology. And the ROI makes sense: IaaS turns IT architecture from a capital expense into an operational expense, which can be tied directly to revenue streams. 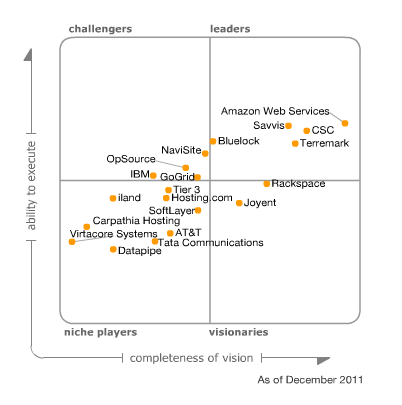 In December 2011, Gartner published a Magic Quadrant on IaaS, listing Amazon, Bluelock, Terremark, Savvis, and CSC as leaders, with Rackspace and Joyent as visionaries, and GoGrid, OpSource, NaviSuite, and IBM as challengers. Amazon in particular has been pushing the IaaS revolution with the Amazon Web Services virtualized infrastructure. The company is continuing to add functionality and partners while lowering its prices, making it the undeniable IaaS leader in terms of market share. But as the Gartner Magic Quadrant indicates, there are other key players to keep in mind as well. Next week, we’ll dive into the top 10 IaaS providers, in a new installment of our editorial series on how the cloud is transforming the way business is done today. Looking for more information on IaaS, PaaS and other types of cloud hosting software? 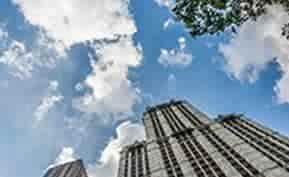 Be sure to pay a visit to the Business-Software.com resource page on cloud hosting software, the hub for all cloud management content from the Business-Software marketing team and our network of guest contributors.